Once a large solar field is set up at its designated location, what tests can be conducted to show that it performs as expected? Soon, the IEA Solar Heating & Cooling Programme may have an answer to this question, as it is working on internationalising Denmark’s testing procedure. No decision has been made on whether the procedure will become part of a full-fledged standard or be turned into a technical specification. Two tasks of the IEA Solar Heating & Cooling Programme have been involved in drafting a proposal for a new ISO standard to cover solar energy, collector fields and performance testing: Task 55, Towards the Integration of Large SHC Systems into District Heating and Cooling Networks, and Task 57, Solar Standards and Certification. The collector test methods described in the recently published ISO 9806:2017. Performance guarantee – Collector field power output, a fact sheetcreated by Task 45, Large Systems: Large Solar Heating/Cooling Systems, Seasonal Storage, Heat Pumps. Yield data from the long-term operation of large solar thermal fields in Denmark (see http://www.solvarmedata.dk). 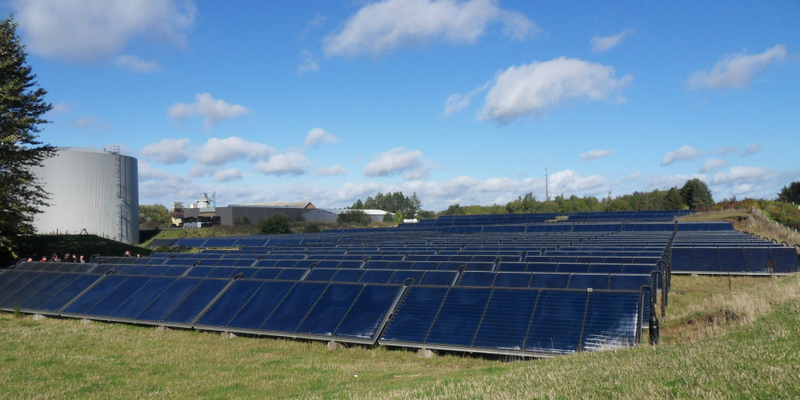 The fact sheet outlines the usual procedure that manufacturers use to test the on-site performance of large solar arrays in Denmark. It has been included in the solar district heating guidelines developed during SDHplus. Is a new standard coming? Last October and December, basic ideas for a new standard were presented during ISO and CEN technical committee meetings. The CEN committee’s subsequent vote on a rough draft showed that the proposal should not be viewed as a guarantee but rather a performance test and that it will be turned into a technical specification and not a full-blown standard. In regard to ISO, it has yet to be made clear whether it will become a technical specification or a standard. The ISO committee is awaiting a new draft and will come to a decision at its next meeting in September. The general idea is to benefit from the long-used Danish procedure for testing large solar district heating plants and comparing real-world yield data to a manufacturer’s guarantee. This on-site test is usually performed after a system has been fine-tuned post-commissioning, which means a couple of months after a plant has been put into operation. The testing procedure may now be approved and implemented at international level via inclusion in a standard. Of course, it will also need to comply with collector standard ISO 9806. Likewise, the test methods will need to be changed to accommodate concentrating solar collectors, as even Denmark’s climate has allowed some plant operators to use them while more may be added soon. In principle, the proposed standard would require a simple examination of a solar field’s maximum performance based on certain criteria. First, solar irradiance levels need to be between 600 and 800 W/m². Second, performance has to be measured at less than 30° incidence to calculate the angle modifier, typically one of the most important unknown variables, and eliminate its impact on the total yield measured during the test. Additionally, the collectors must not be at risk of solar shading or frost damage. The latter means that the test has to be carried out at temperatures above 5 °C. Last, during the one-hour test cycle, the collector needs to show a stable temperature that is always less than 5 K from the mean. Some typical equations should then be used to calculate expected output and compare it to the test results. The standard will not prescribe how much those two values can differ from each other. Instead, manufacturers or plant operators can specify a percentage themselves, be it 2 %, 3 % or 5 %. The reason for this freedom to choose is the substantial dependence of measuring instruments on factors such as quality. The new standard will therefore include some non-mandatory recommendations on how to select the best measuring set.